Trevor Timm: Democrats just handed Trump more domestic surveillance powers. They should know better. Trevor Timm Democrats just handed Trump more domestic surveillance powers. They should know better. There is no reason for the FBI to read Americans' emails without a warrant. Why doesn't Nancy Pelosi agree? The bill is an extension of what’s known as Section 702 of the Foreign Intelligence Surveillance Act (FISA), which allows the NSA to warrantlessly target people in other countries who are communicating with Americans — which means that the collect the personal communications of Americans without their knowledge. Currently, the NSA has over 100,000 foreign nationals under this type of surveillance now, but it also has the communications of the potentially millions of Americans they've talked to, texted with and emailed over the course of the surveillance. The FBI has access to this vast database of information and regularly searches it like Google without a warrant, for crimes that have nothing whatsoever to do with terrorism..
Privacy advocates have long argued this practice is unconstitutional, and any American agency should need a warrant to go back into that vast NSA database of Americans' communications and date in order to mine it for information — like the Fourth Amendment requires. But with Section 702 expiring next week, the Trump administration has of course, demanded that Congress pass an extension with supposed “reforms” that do hardly anything to stop the feds from abusing their powers and actually codify the ability for the FBI, in many cases, to search Americans’ emails without a warrant. Paul Ryan and House Republicans needed Democratic votes to ensure that the measure passed because at least some members of House Freedom Caucus, led by GOP Rep. Justin Amash, were staunchly opposed to any extension without robust safeguards to protect Americans’ privacy. Along with a large group of Democrats — including the Democratic National Committee vice chairman, Rep. Keith Ellison, D-Minn — the group had an amendment to the extension known as the USA RIGHTS Act, which would have replaced the privacy-invasive bill with a privacy-protecting one. The USA RIGHTS Act would have required the FBI to get a warrant to go back into the NSA’s Section 702 database to search for Americans’ information. It also would have provided additional safeguards to make sure the bill doesn’t turn into a domestic surveillance bill. 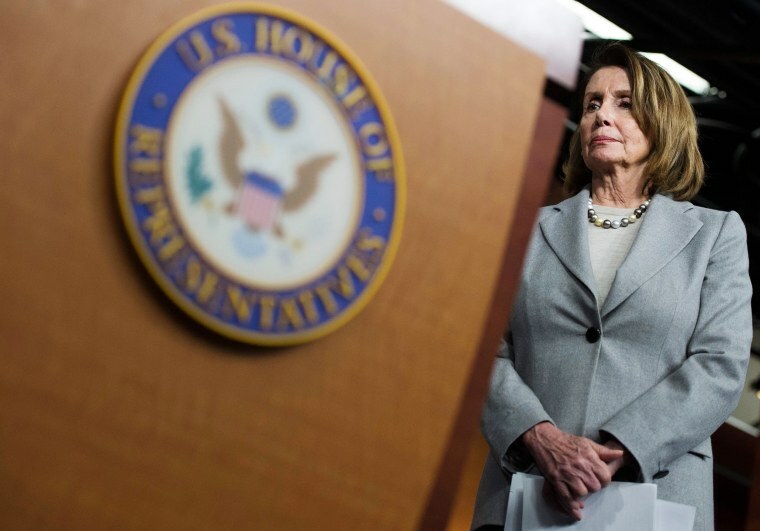 Yet up until just hours before the vote, the most powerful member of the Democratic Caucus, House Democratic Leader Nancy Pelosi, was notably silent on the bill. If Pelosi had whipped Democrats to vote against the bill and supported the USA RIGHTS Act instead, there’s a good chance that Trump and Ryan would have failed to get their full extension. Yet, just before the floor vote today she said she would not support the USA Rights Act and shamefully voted to hand Trump exactly what he wanted. Almost worse than Pelosi's willingness to go along with the NSA was Rep. Adam Schiff's, D-Calif., who has seen his star rise over the last year being the Democrat’s go-to voice on the Russia investigation. On CNN with Jake Tapper this weekend, Schiff talked at length how he thought Trump was abusing his power and misusing the Justice Department to go after his political enemies. But for all the supporters' insistence that the NSA and FBI “need” these powers, no one proposed to actually strip the agencies of their ability to conduct surveillance on targets abroad; even the USA RIGHTS Amendment did nothing to restrict them in that regard. It merely would have protected Americans whose communications get swept up in the NSA’s vast nets from being abused after the fact. In 2018, we have the worst-case-scenario president about whom privacy advocates have warned for years while seeking to restrict government surveillance powers. His administration has targeted on Muslims and immigrants for massive new law enforcement measures and even openly mused about conducting surveillance on his political opponents. Democrats should have had the foresight to roll back the Bush-era surveillance laws under President Obama; it's unconscionable to now hand Trump even more leverage to seek retribution and give him a green light to conduct unconstitutional surveillance on Americans. Senate Democrats should do the right thing: Oppose Trump by opposing an unconstitutional bill that would violate the constitutional rights of millions of Americans. Trevor Timm is the executive director of Freedom of the Press Foundation. His writing has also recently appeared in the New York Times, the Guardian, USA Today and the Columbia Journalism Review.